Inspired by the raw beauty of nature, Rachel created her signature piece, the Organic Link. ''After I designed it, I instantly fell in love with it. I had never seen such a universal piece, and the finish is amazing.'' Other inspirations come from her everyday surroundings, the naturally imperfect beauty of gemstones and, of course, her grandmother's jewelry box. Since 2005, Rachel Eva Designs has expanded to include several collections of bracelets, necklaces and earrings--each focusing on a specific material. For example, the Organic Link Collection is a unique blend of raw shapes and mixed metals. 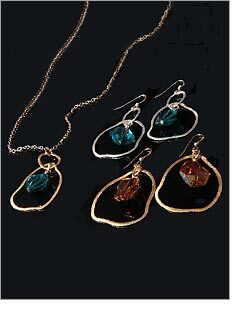 The Sparkler Collection includes the organic link as well as Swarovski crystal bead accents. Raised in an artistic family, Rachel took to jewelry-making naturally. The self-taught artist considers herself blessed with an instinct for creative jewelry design. View more of Rachel's jewelry on her website at www.racheleva.com.